Johnny Williams scored 12 points on 50% shooting in VCU’s road win at George Mason. The Rams picked up a big road win against George Mason to open Atlantic 10 play and will look to make it a 2-0 road start when VCU travels to Pittsburgh to take on the Dukes of Duquesne tonight. The black and gold are riding a five-game winning streak, Duquesne a four-game winning streak. One will end tonight. Key stat to jump into right from the jump when it comes to talking Duquesne: the Dukes have played the sixth easiest schedule in America. That schedule has included some expected wins over bad teams, some perhaps expected losses to bad teams, one blowout to Kentucky and one very surprising upset of Pittsburgh. That last bit will have the attention of VCU and prevent any bit of looking past the Dukes. Still, Duquesne is coming off a disappointing 6-12 A-10 finish this past season and lost essentially everyone from that team. With that, the Dukes have played a very young rotation led by freshman Mike Lewis who’s averaging a team-high 12.1 points per game. Lewis is one of four double-digit scorers for the Dukes one an offense that ranks 266th nationally in adjusted offensive efficiency. Senior Emile Blackman has been head coach Jim Ferry’s only dependable bit of experience on this roster and with that, have seen losses to the likes of Robert Morris, Tennessee Martin and Maryland Baltimore Country, the three sub-200 losses for Duquesne in their non-conference schedule. In many ways Duquesne has been a bit of a flip of last season’s team, trading in a solid offense and bad defense for a bad offense and decent D. Still, after a road win over kenpom No.217 Fordham, 75-72, the A-10 road promises to get a bit bumpier for the Dukes starting tonight. The Rams will be just the fourth top-100 team Duquesne has played all season (fourth top-150 for that matter). The Dukes were hammered by Kentucky 93-59, dropped a road contest at No.96 Penn State, but somehow…someway, managed to take down Pittsburgh in a neutral court battle earlier this year. Duquesne limited the Panthers to 13.6% shooting from distance in the win (3-22) and escaped with a big 64-55 victory. The would follow up with a loss to No.253 Robert Morris then a three-point win over No.344 Central Connecticut State. Players I’m watching: Mike Lewis and Nakye Sanders. Lewis is a freshman “volume shooter” but one who’s strung together a nice little stretch of games over this four-game winning streak. He’s averaging 15.4 points per contest his last eight games and has been a much more efficient scorer as of last as well. Sanders on the other hand is a 6’8 big connecting on 65.3% of his attempts this season that can clean up on the glass when given the opportunity. I’m of the opinion Duquesne will need nice games out of both to pull off an upset win tonight. First the big news: freshman De’Riante Jenkins will miss the next six to eight weeks of play. That is a very underrated loss for VCU as Jenkins led the team in three-point shooting at 44.4% and was good for some serious momentum plays for the Rams as of late. His 65.2% true shooting percentage led all VCU players averaging double-digit minutes. Very tough loss. In his place will have to come two things: 1) improved performances from the likes of Doug Brooks and Samir Doughty and/or 2) A breakout performance from Malik Crowfield. Starting with the former, while Ram fans have loved riding the excitement of Brooks and Doughty, neither has been efficient and in fact have been the exact opposite. The duo both check in as VCU’s only double-digit minute performers to post true shooting percentages below 50%, so a loss of Jenkins minutes turned into increased PT for Brooks and Doughty would likely equal a net loss in efficiency unless the duo either takes smarter shots or starts hitting the difficult ones. Enter options 2) Malik Crowfield. Once upon a time, in a Siegel Center far far away, Crowfield was an early season starter. Then came Baylor and as if a phantom, Crow’s minutes disappeared. But here’s something to know: in his four double-digit minute contests Malik has averaged an offensive rating of 137.3. It’s a small sample but know that VCU’s current top offensive rating for a double-digit minute player is…er, was…De’Riante’s 118.2. The next best is Justin Tillman at 116.4. We heard about his poise and maturity this summer and he’s flashed just that, but due to De’Riante’s injury it may be time to see more of it from Malik Crowfield. I for one am a believer. Aside from the injury situation another thing to watch is this: TURNOVERS. Long story short, VCU has been an incredibly efficient shooting team. They do this by basically taking high percentage shots. It’s a concept so smart/easy you’d THINK more teams would do it (but they don’t). What hurts the Rams however is they make about as many mistakes on offense as a nervous middle-schooler going in for his first kiss after a solid night at cotillion. 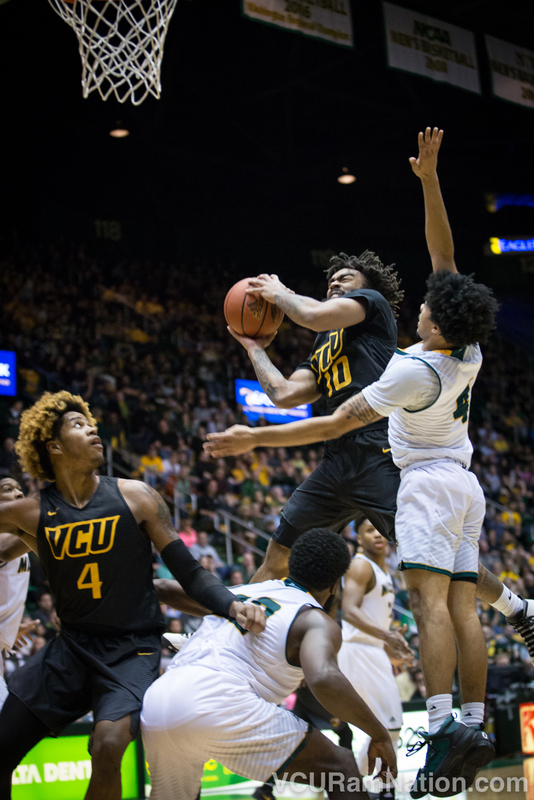 VCU turned the ball over 21 times in a nine-point road win at George Mason. Let that sentence remind you of VCU’s potential. You turn the ball over 21 times…and win by nine on the road. Let’s do the math: take back nine of those possessions to hit VCU’s game goal and 2015-16 season average of 12. You convert them at your current effective field goal percentage of 53.2% and you’ve just won on the road by at least 18 points. That’s how good can be. But can they really, or are turnovers just a part of this year’s team’s DNA? For starters, VCU can help negate the high turnover numbers they are capable of posting with a strong turnover defense. VCU has been incredibly accurate when it come shooting their own foot, but as high as the Rams’ turnover numbers have been, Duquesne’s are basically identical. Not much difference in VCU’s 20.2% offensive turnover rate and Duquesne’s 20.1%. What helps the black and gold however is they have one of the nation’s best turnover Ds while Duquesne has a bottom-100 turnover defense. So assuming the Rams can at least break even on the turnover battle, that would in theory bring this down to shooting. The Rams have on the whole been one of VCU’s most efficient shooting offenses in recent memory. They do this by pounding the paint relentlessly. Without De’Riante Jenkins silky-smooth touch from deep, this becomes even more necessary. I’m rambling now, but my ultimate point is this: we win if we take smart shots inside and finish them. Duquesne basically looked good one time this season and that was in a nine-point win over Pittsburgh. So how did they beat Pittsburgh? Well, for starters they made sure to beat Pittsburgh and not themselves, turning the ball over just eight times. So turnovers will clearly be key. But here’s the difference between VCU and Pitt: VCU’s turnover defense ranks 15th nationally, Pitt’s ranks 350th out of 351 teams. Duquesne will need to match their turnover performance against one of the worst turnover defenses against one of the best. But that wasn’t all they did against Pitt. They either 1) defended well or 2) caught the Panthers on a very off shooting night (real talk: I didn’t watch that one). The Panthers shot just 13.6% from three, which is a major killer when you shoot 22 of those suckers. So the key tonight will be to first hold on to the ball, then second either force VCU into bad shots or hope they just take dumb ones. Kenpom: 75-67 VCU win with a 76% chance of a Rams victory. Watch: American Sports Network, Official game day headquarters are Buffalo Wild Wings locations at Virginia Center and downtown on Cary Street in Shockoe Bottom. Great write-up. Good to see some analysis of the numbers when it comes to Deri healing and Malik and others increasing playing time. Hope option 2 turns out the way we want it!